Spring is here and if you are still hesitant about setting up a DIY vertical garden or Greenwall at home, rejoice, help is at hand 24/7. This little book 'DIY Vertical Gardens...Expert Advice for Greenwalls and Living Walls at Home' by Keri Algar is a little 'must have' gem. I am happy to promote this easy read because Keri empowers and educates even the pinkest thumb to succeed with creating a vertical garden at home without having a horticultural degree! Keri's research has brought you a book choc full of tips and 'I can do this' techniques for creating a healthy, well built vertical garden or greenwall that will GIVE more than it will take out of you to manage. In this little pocket wizard, you will find easy to follow, horticultural advice for growing lush foliage, vegetables and flowers in small spaces, indoors and out. But there's much more- you'll find home remedies for insecticides and fungicides which will save you money. If you are a parent worried about little Johnny getting dirt on his hands, read the section on why bugs in soil are good for the brain! Did you know that succulents can suffer sunburn? What are plants telling you when they go 'leggy'? There's an excellent chapter on potting mixtures and growth media with Australian horticulturist and Greenwall expert John Daly and whether you're into veggies or flowers, there's a handy troubleshooting guide and some quick reference checklists to keep you gardening like a pro. Of course I can't forget to thank Keri for including the steel system I sell too. Thanks Keri, I also love the way you've scattered quotes around the pages like little seeds helping our imaginations to germinate. Fancy home grown veggies but only have limited space or a 'concrete yard'? No problem. 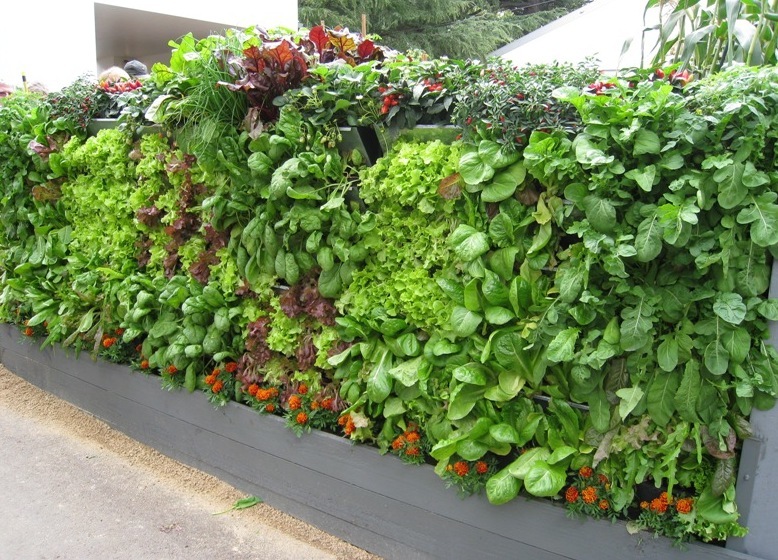 Vertical vegetable gardening is the delicious answer! Vertical Gardening has its challenges and so to, does growing vegetables. If you have a basic understanding of the principles of vertical gardening and the few requirements that vegetables have to really thrive, you are more likely to have a positive experience with your vertical vegetable garden. So… a great solution for space restricted gardeners is to ditch the pots and use the Garsy vertical garden system. Growing a substantial produce garden using pots takes up a lot of floor space. The Garsy vertical garden systems actually CREATE gardening space, you can triple the square metreage of your area by going vertical and reap an abundant harvest! The soil volumes in the Garsy systems are huge compared to pots and many other vertical gardening systems. In this vertical gardening system, plant roots can travel around in over half a cubic metre of soil media volume. This large volume of soil helps tremendously with maintaining even temperatures and moisture levels – saving you time and water when compared to other vertical garden systems and other planters. Your vegetables will thrive in this vertical garden system but importantly, they also look sensational. Your vertical garden will become a feature in any space – a living wall of green that beautifies and also feeds the whole family. Aesthetics are so important in restricted areas but everyone deserves fresh salad on hand! Due to the large body of soil media in the Garsy systems, plants are able to draw from a large supply of nutrients. Regular feeding with traditional liquid fertilisers from a watering can and some slow release fertiliser a few times a year is all that is required. Many vertical vegetable garden systems are based on hydroponic methods of growing where the plants are anchored to a matting or foam and have further systems that control watering and fertiliser solution applications; however the Garsy vertical garden system is based on a traditional, low-tech gardening experience. This vertical vegetable garden is filled with soil media (potting mix) from top to bottom and essentially you just plant your favourite vegetable seeds or seedlings into the exposed tiers of potting media with your trowel and water them in. You can simply hand water your vertical vegetable garden with harvested rain or mains water with any method you like, watering can, hose or use the included automated dripper system. You may have abandoned the idea of growing your own fresh food due to any number of reasons but hopefully, this list and the promise of crisp salad greens, aromatic herb dressings and plump, juicy strawberries in the wink of an eye will convince you to change your mind! to take the strain off your back and the pressure of your knees - durable, vertical gardens like the Garsy Greenwall will provide years of abundant fresh food for the whole family. The large root space in each basket allows plants to thrive and you to dig at a comfortable height, even from a wheelchair! weeds find it more difficult to flourish in a vertical garden but if you do find an invader it is very easily and quickly removed. Pests and diseases often find it harder to thrive too, given the air circulation and breezier location of some vertical gardens. I have yet to see a climbing rabbit or a beloved pet scaling a vertical garden to find a good spot to do its business and slugs would need to be of Olympian stamina to ruin this veggie patch! with plants at waist and eye level, maintenance and replacement of individual plants is a breeze. Potting media is tailored to suit the root space, softer to trowel and plant into so you don't have to spade into clay or break up ground with a pick. Smaller amounts of fertiliser/compost are required with no wastage into the surrounding ground area. Irrigation in the soil based, Garsy system works equally well whether done by hand or with an integrated drip system- you can even recycle storm water from your gutter. Due to the large volume of potting media, this system does not dry out as quickly as traditional large pots. There is no need to waterproof your wall behind a Garsy Greenwall as an air space of 50mm behind the system allows good airflow, no mould growth and no damp walls. Haven't got a green thumb? No worries- a prolific harvest of abundant fresh veggies and herbs from doorstep to plate is easy with a compact, clean and convenient vertical garden. It's child's play.